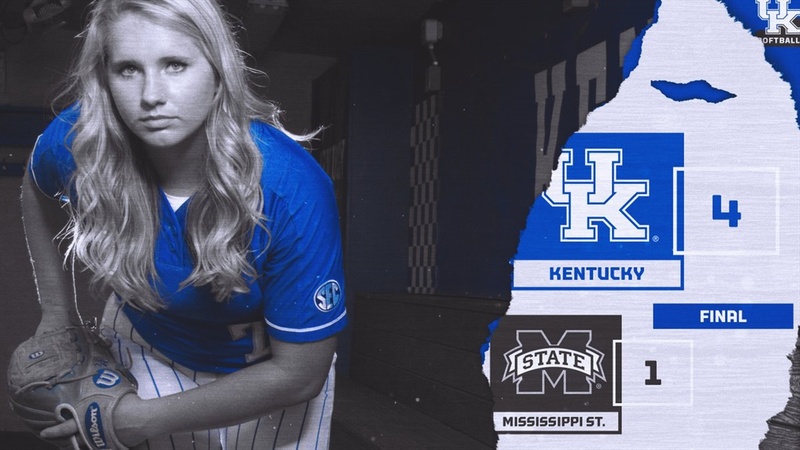 The University of Kentucky Softball team closed out their weekend series against Mississippi State on Sunday with a 4-1 victory. The win earned the Cats a sweep of the Bulldogs and a 6-0 mark in SEC play; the best start in program history. Kentucky got on the board with two runs in the first inning. After drawing a walk, Kayla Kowalik came around to score on an double to the wall by Abbey Cheek. Cheek would be brought home to score by Alex Mertens who smacked a single back up the middle, (UK 2, MSU 0). The game turned into a pitcher’s duel from that point on and the Cats would not score again until the bottom of the sixth inning when Katie Reed smacked a two-run double to extend the Kentucky lead, (UK 4, MSU 0). The Bulldogs would add their only run in the top of the seventh on a solo home run.